April 12, 2016 – DKI, North America’s largest disaster restoration contracting organization, today announced that one of its member companies, K-tech Kleening Systems of Weston, Wis., kicked off National Volunteer Week with K-tech Charities through two community charity events held during the weekend of April 9 and 10, 2016 at Dales Weston Lanes in Weston, WI. The first event was Polka Meets Country, K-tech’s sixth annual musical fundraising event, benefiting breast cancer research, St. Jude Children’s Research Hospital and local food pantries. Polka Meets Country ran on Saturday, April 9 with live music from 6:30pm to 1:00am. The two featured bands, Led West and Polka Connection alternated sets and even played together for an hour during the evening. 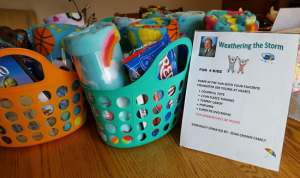 On Sunday, April 10, K-tech took part in another charity event at Dales Weston Lanes from 12:00 to 4:00pm, “Sean Cronin – Weathering the Storm.” K-tech, along with other business leaders organized the event, benefiting Sean Cronin, a former weatherman for Channel 9 (WAOW), who is now suffering from a life threatening illness. Cronin dedicated a decade of his life to Channel 9’s weather department. Entertainment included bowling discounts, a live auction, silent auction, and performances by Led West and Polish Connection. All proceeds supported Cronin and his family.